Finally I get a free moment to shoot out a post! As mentioned in the last mini-post, we've been in the process of moving and it's taken me a while to figure out where everything is. Also because I was watching the baby, I had my mother-in-law and niece packing for me so unfortuatnlely it took extra long to figure out what was in which boxes! FINALLY got it all done. Moving is such hard (and stressful) work! I love the house we are in now. (Just a rental until our new one is built.) 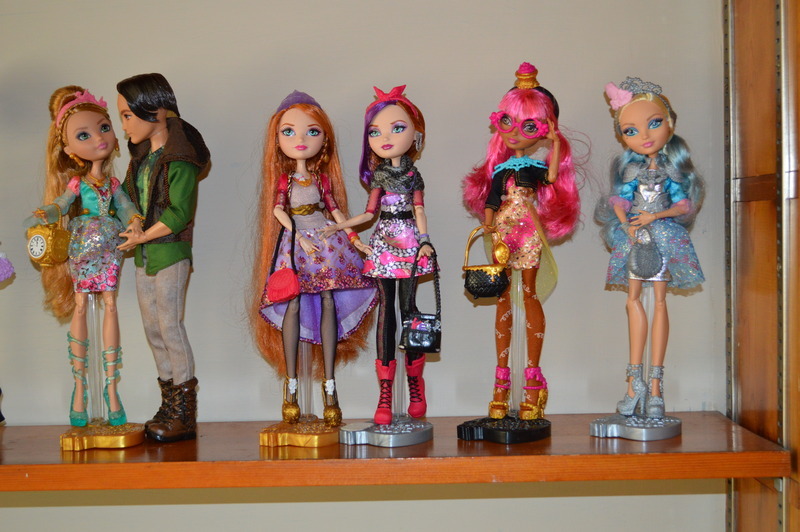 Naturally I had to set up some dollys! Most from my former shelf are carefully packed away but had to set up my newest loves. And the guest bedroom is just PERFECT for them! One thing I like about old houses. They contain details that might not be found in a newer home. Like this built in bookcase. Perfect for my ever-growing EAH collection! Cedar, Blondie and my three awesome Wonderlandians: Kitty, Lizzie and Maddie. 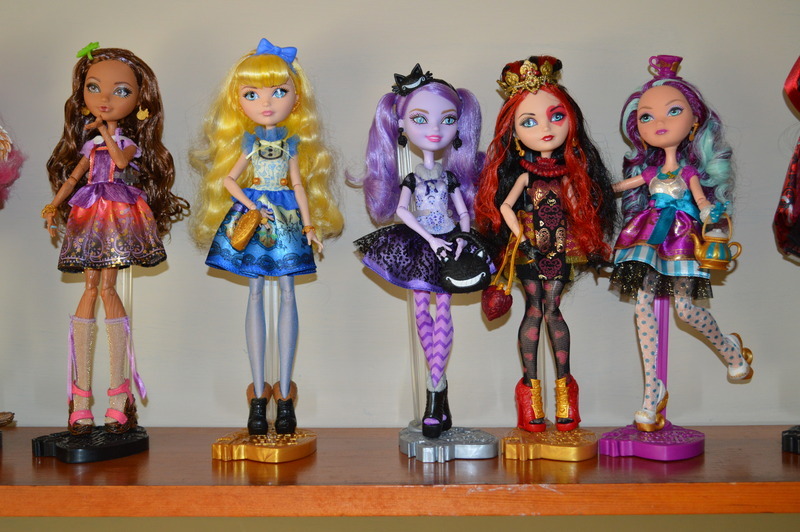 The fabulous Cerise, Duchess, Ashlynn and her love Hunter, and the sweet sisters Holly and Poppy. And on the end my two newest: Ginger and Darling. In the middle we have a collection that I have not featured on my blog before. This is my "something special" that I mentioned in the subject. My Lord of the Rings Coronation Gift Pack. I LOVE LOVE LOVE Lord of the Rings. It's my favorite books and movies of all time. So when I saw these action figures manufactured by Toy Biz, I wanted them. Because I have the best parents I received them for Christmas quite a few years ago. I love the detail however the faces of the girls could be a little less "old" I guess you could say. They didn't make Eowyn and Arwen as youthful as they look in the movies. 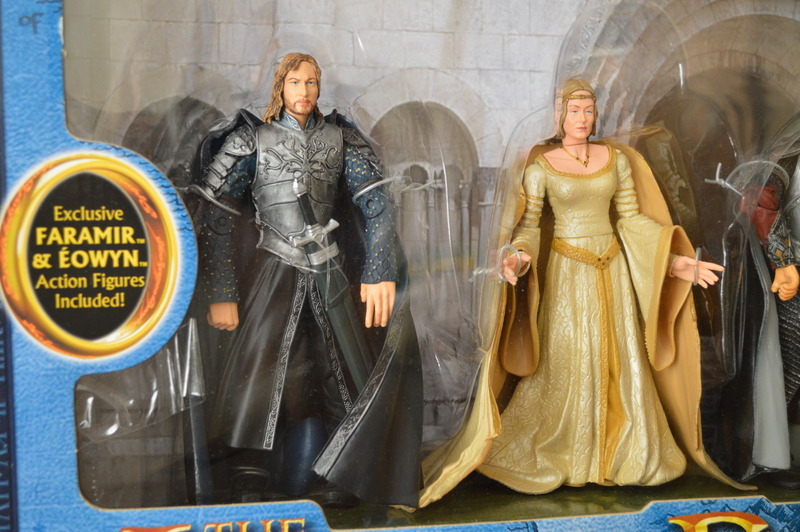 Here we have Faramir (BE STILL MY HEART) and Lady Eowyn. 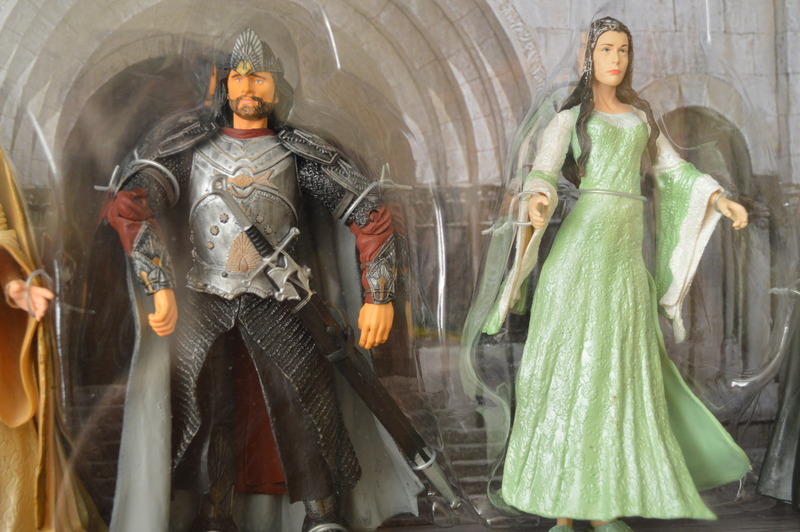 Next King Aragorn and Queen Arwen. I just love the detail on these figures. They are really accurate and that's one of the reasons why I wanted them. 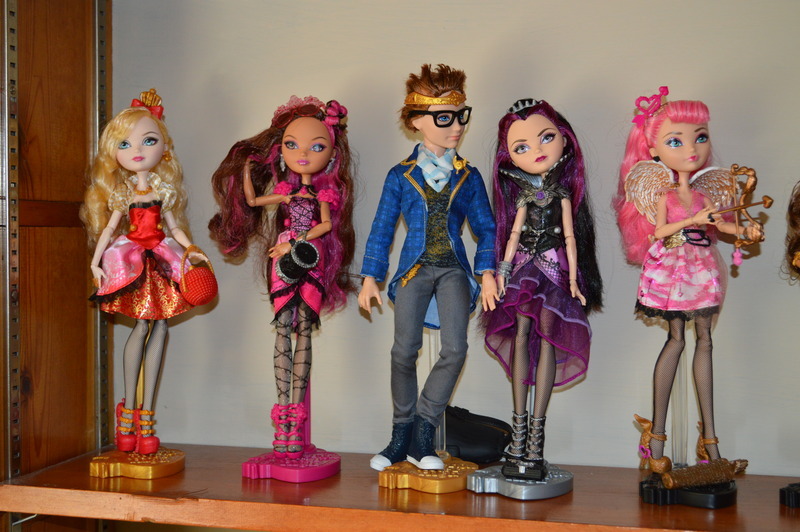 Alright, on to the newest members of the Barbie family! 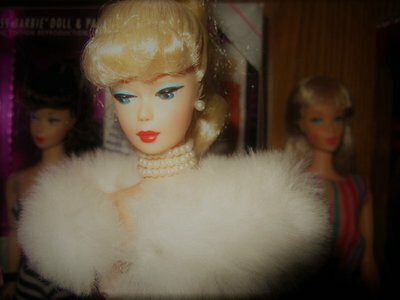 This is Viveca from Barbie and the Three Musketeers. Surprisingly she still has her crown/mask. 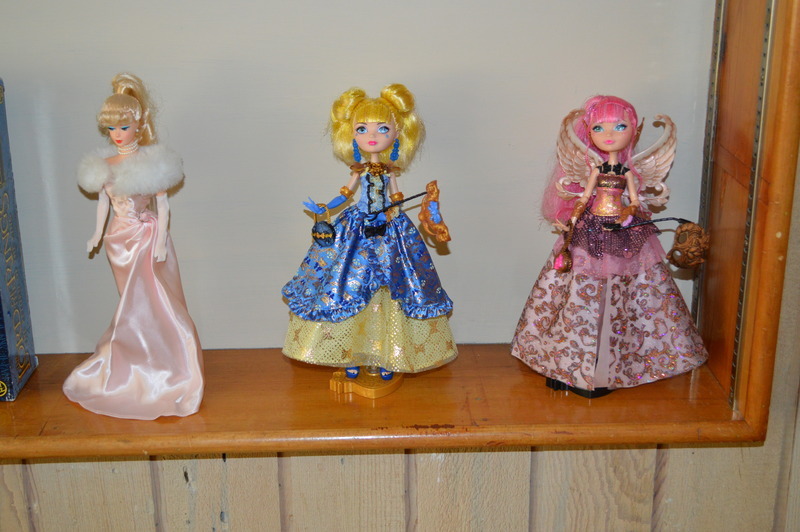 You may recall from a long time ago, I picked up Corinne and Aramina also at the thrift store. Now I have all 3! I have a full outfit Corinne (Barbie) and a partial outfit for Aramina. I may have to buy them on eBay. It's fun to have them all now! 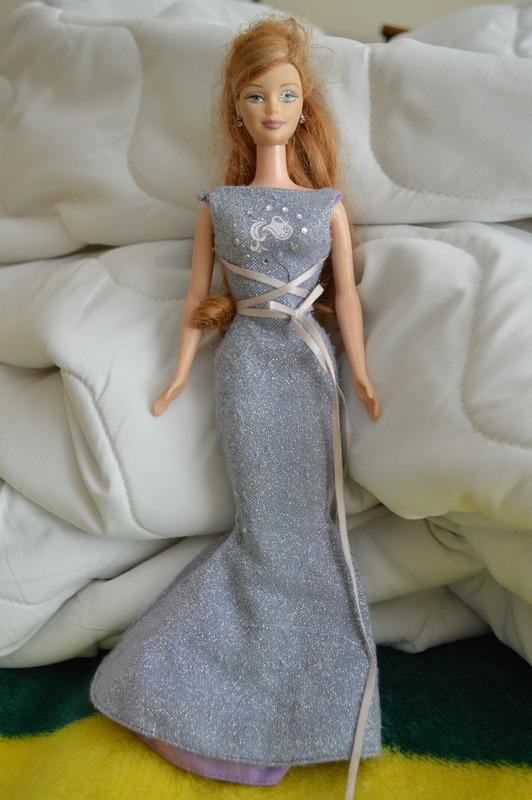 This one is a generic new body doll with a handmade dress. I don't think the entire dress is handmade but I know the lace on the front is. It's kind of haphazardly sewn on. Kind of pretty though! Next this super sweet girl. And she still smells like strawberries! I just love her! I thought she might be one of the Beach Sweetie dolls but couldn't find one that had this outfit. Anyone know who she is? Next we have this beautie. Mackie head mold? Yes please! This is one of the 2004 Zodiac Dolls. This is Aquarius. Her dress seems to be a little faded and her earrings are mostly missing but her emblem on the dress is intact so that's a plus. For $1.00 I couldn't pass it up! Unfortunately her eye is a little wonky too. Boo. But I love the Mackie molds, they are my favorite. I have this girl NIB. And lastly, I bought this. Also for $1.00 I couldn't pass it up. 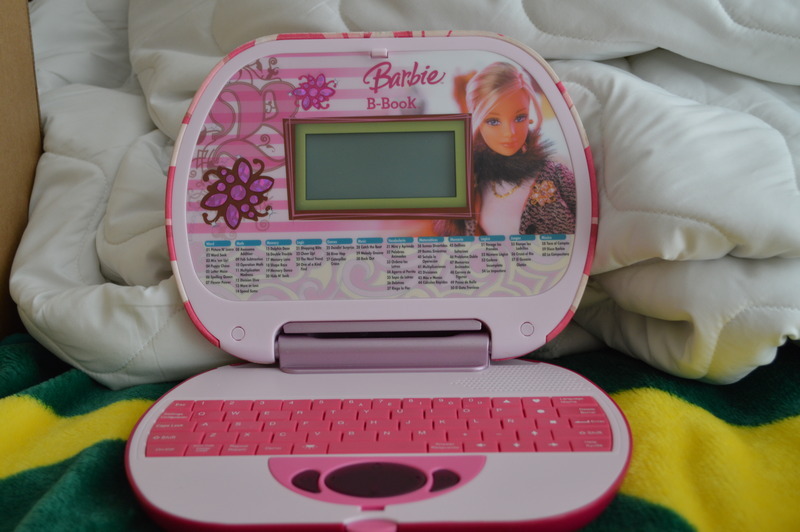 It's the Barbie B-Book Computer! Works good and has fun word and math games for a child. 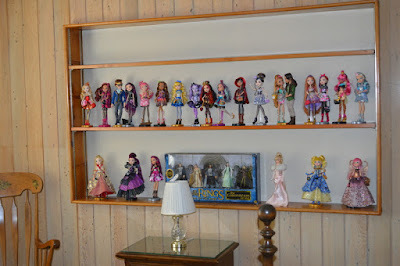 Terrific dolly shelf in your rental! Perfect size for them. Well, I finally caved and bought Apple White and Ashlyn Ella in the Mirror Beach line! 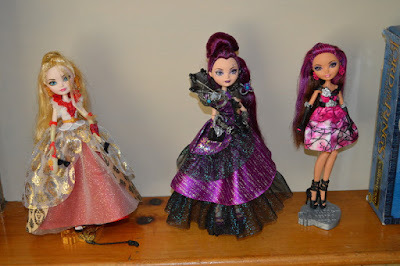 My first EAHs and my first articulated dolls. Can't wait to play with them. I had looked at Ashlyn Ella at Walmart (loved her ice blue shoes) but just couldn't commit at that time. 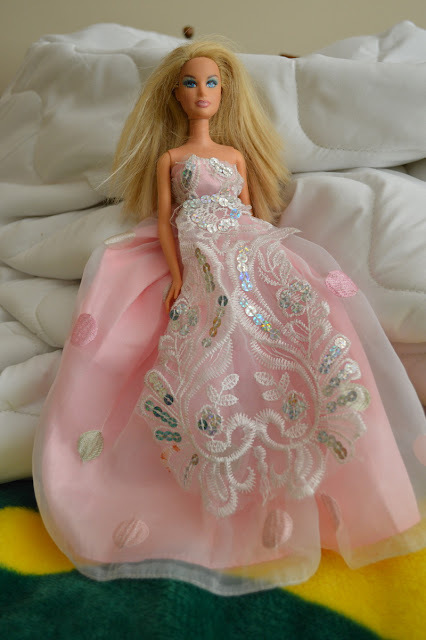 Was trying to decide between EAH, New Style Barbie with the flexible feet or the expensive Makies. Kept looking at EAH online and found the Mirror Beach line. Perfect for me since I will be re-dressing them. They don't have rings, earrings or any accessories except for a necklace and ... SUNGLASSES! Already have an idea for a photo opp with the sunglasses. 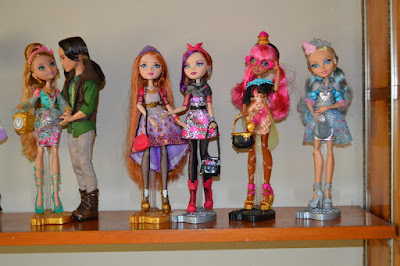 Apple also does not have the mass of ringlet curls but her hair is still nice with a loose curl/wave. They didn't come with stands, either. Just hope they don't develop the glue in the head issue. 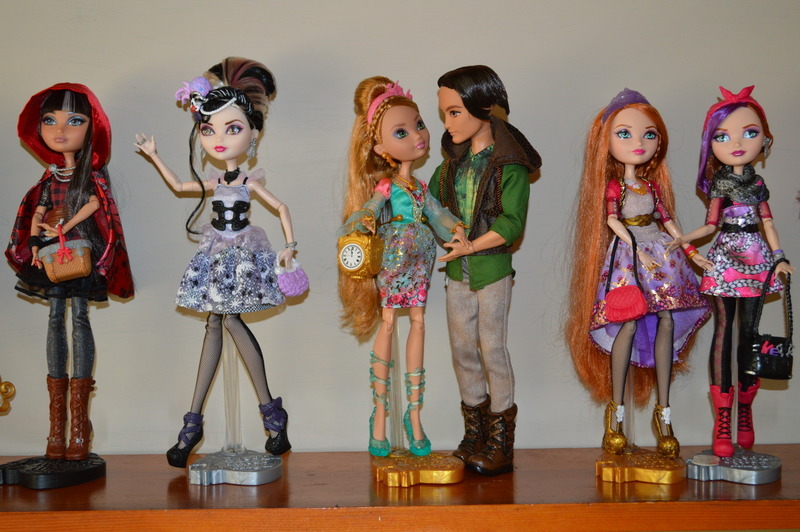 I'm so excited you got some new dollys and articulated ones too! The Mirror Beach line is very cute. And very budget friendly, I think they've come down in price since they were released. Ashlynn is my absolute favorite EAH doll, Her shoes get me every time, with they had them in my size! 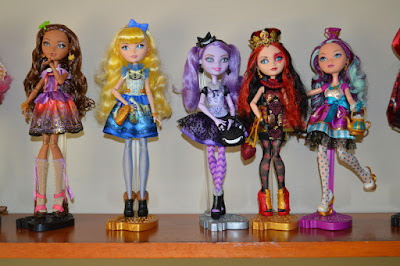 Are you thinking of getting the Madeline Hatter from the Mirror Beach line too? I would love to see what you are doing with them. If you can, upload your pictures and send me the link. I love seeing others OOAK creations! I've just opened both EAH dolls and I gotta say I'm a little "disenchanted" (ha, pun intended) with their posing abilities. And I'm not sure I'm going to keep them. They do look cute sitting together on my sewing machine so I'll see if they grow on me. And I smell something kind of strong in their hair/heads but I'm not sure if it's glue or hair product. Yes, they are very budget friendly and I realized that they could also be very low quality due to what I've read about them online. They were only $12.86 or so at my local Walmart. I don't have any accounts on Flickr or Instagram or anything so the only way I could send you photos of anything I may make would be to email you directly. I looked on your blog to see if you had your email listed and couldn't find it. That's understandable with all the spammers around. Don't know if my email shows up anywhere when I comment or not. Ha! I love the "disenchanted" comment. So sad that you feel that way! The basic first wave generic Apple White is only $12-$13 on amazon, maybe you would like her better? They've also came out with the first wave Ashlynn as a stand alone (without Hunter) if you are willing to pay a little more (I would, she's my favorite :) I also think that by far, the first wave is the best Ashlynn, and has the cutest shoes! My email is on my Google+ page! Click on my name in the header of my comments and it will take you to my page. Then click the "about" tab at the top and my email will be on the right hand side. Feel free to email me anytime! That built in bookcase is perfect for housing your dolls. 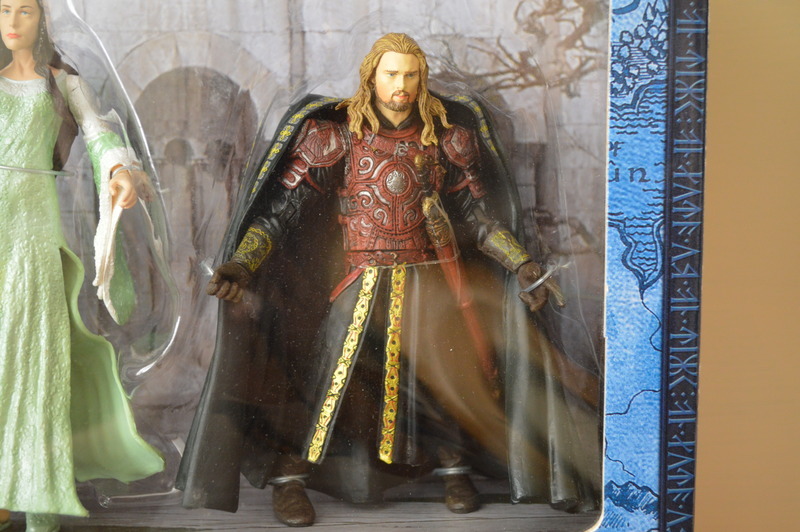 The LotR figurines are great, love how detailed they are. Congrats on your dolly loot. There is actually a fourth musketeer girl named Renée, she is the black girl from the movie. 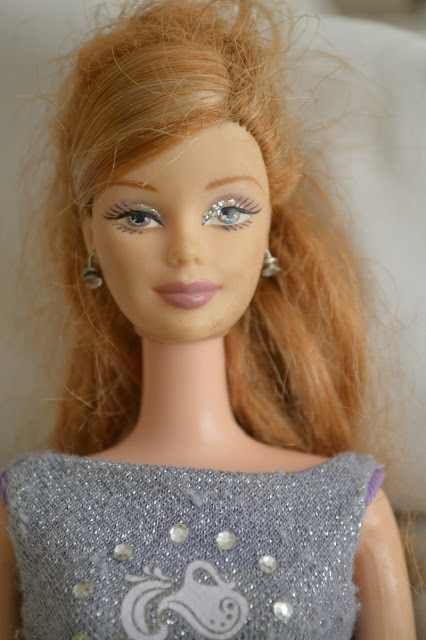 The closed mouth Barbie might be the first version of the 2007 Lip Smackers Birthday Barbie, the second version featured an open smile. 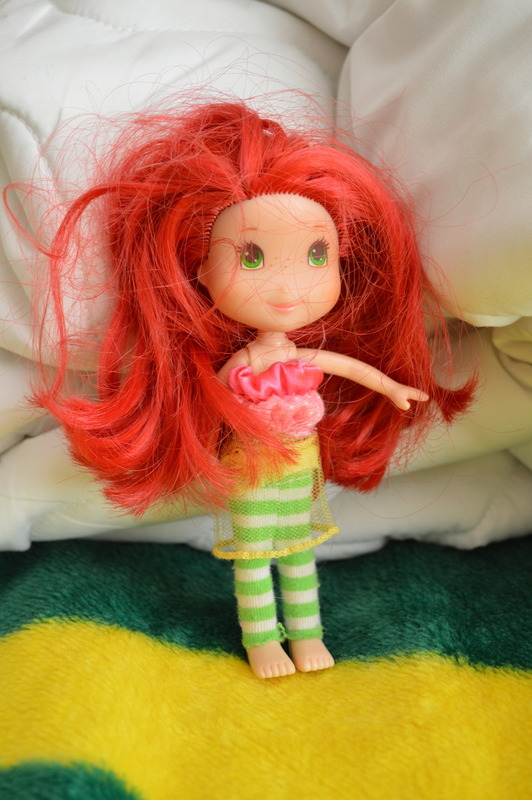 Sweet little redhead is a Strawberry Shortcake doll, but I can't tell you which one. Aquarius is very pretty, great catch! I don't think her eye is wonky, they just poured too much glitter on the inner rim. Sometimes you can get rid of some of the glitter flakes by carefully scratching them off with your fingernails. I think my expectations were a little high as to some of the sitting poses I thought they could do. I'll reposition them every so often and am liking them more now. I kept trying to identify the smell coming from their heads and realized much later that night when I started to not feel well, that basically, I had been "sniffing glue". Lol. That had a lot to do with my disappointment, I think. Hopefully, some of the generic fashion doll shoes I have bought over the years will fit them and I can alter some patterns to fit those tiny bodies. No, I don't think I will get Madeline Hatter but I do like Kitty Chesire because of her smile. I wish the rest of the characters had a little bit more of a smile. Followed your instructions to get your email but was unsuccessful. Most likely it's my computer. It's running Windows 7 and apparently Windows 7 has lots of 'problems' that are just now cropping up. Plus I can't uninstall IE 9 and download IE 10 or 11 (another Windows 7 problem). I'm trying to get another browser installed. 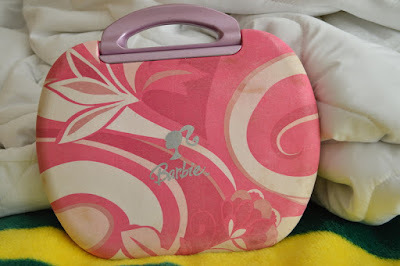 I used to have one! So sorry Teresa! Here is my email, feel free to contact me! I'm sure you can figure it out. :) Have to try to keep from getting bot spam! Anonymous, I love them don't you? They smell SO good! I have a few old ones in storage, wonder if they still smell good!